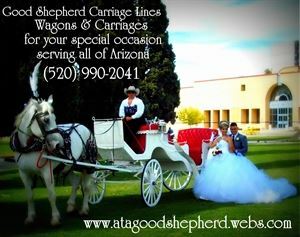 Providing elegant equestrian french wedding carriages & western wagons for any event! At your location or ours. With your choice of horses - Clydesdale, pure white, black & white paint or jet black! The Good Shepherd Ranch is a unique, working horse ranch event venue! We cater to corporate events, weddings, family reunions & clinics. Have your corporate event or family reunion here & have entertainment on a Wagon ride, get a horsemanship lesson to build trust with a horse, Learn to harness & drive a team of horses/wagon & have a great cowboy dinner after. If you are having a wedding & want a more elegant touch we have options available. Please email or call for more info! Plan your event with us & support not only a local business but a horse rescue also!